Graduate and professional education can open greater opportunities for Louisvillians in the city’s educational and employment systems. Achieving a graduate or professional degree can positively impact an individual’s overall ability to thrive in their community, and growing up with caregivers who have achieved graduate or professional degrees increases a child’s likelihood to pursue secondary education outcomes. Louisville currently ranks 6th among its peer cities in rates of earned graduate and professional degrees, with 14.1% of working aged adults achieving a graduate or professional degree. 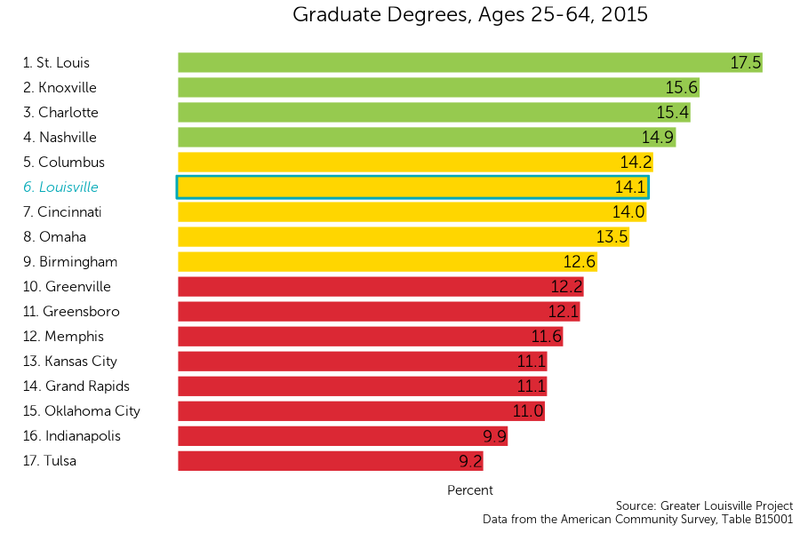 Although, Louisville ranks 6th out of 17 cities in earned graduate degrees or higher among young adults, the rate of these educational outcomes varies substantially within the city. In the map to the left, areas where bachelor’s degrees are earned at a high rate can be seen in purple, where those with lower rates of bachelor’s degrees or higher can be seen in blue and white. Similar to the other post-secondary degree maps, there is a distinct divide between western and eastern Louisville that creates an imbalance in the secondary educational outcomes experienced by these communities. Post-secondary educational achievement is most concentrated in neighborhoods in eastern and north eastern Louisville such as Northeast Jefferson, where 40% or more of the adult population have at least a bachelor’s degree. Conversely, the lowest concentration of earned bachelor’s degrees can be seen in the South Louisville and Chickasaw-Shawnee neighborhoods, where as little as 0-1% of young adults have earned a bachelor’s degree or higher. Louisville has experienced a steady increase in earned graduate and professional degrees since 2010. Though the incline is slowly moving, the positive trend creates a hopeful outlook for future rates of graduate and professional degree attainment in Louisville. Additionally, Louisville seems to be increasing at a faster rate than some of its peer cities.